UK, 1957, 103 minutes, Black and white. 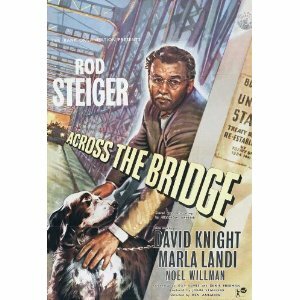 Across the Bridge turns out to be an unexpectedly good thriller. It is interesting Grahame Greene territory, a psychological thriller of a chase and of guilt and repentance. Rod Steiger is excellent in the central role, a financial crook on the run, proud but humiliated and, finally, dependent on the friendship of a dog. 1. Was this just another thriller? If not, what made it different? 2. How was the atmosphere of the film quickly set ? in the English and New York sequences? 3. How did Rod Steiger quickly convey his character in the New York interview and the anxious phone calls? 4. 151d the audience have any initial sympathy for Shaffner or was he an unsympathetic swindler? 5. How effectively was the train trip written and filmed ? the supplying of the newspapers, the conversation and plan to take over another identity, the throwing of the body off the train, getting off the train etc.? 6. How important was dog Dolores? The fact that Shaffner couldn't even get off the train without her; his initial cruelty and hostility to the dog; the dog's continual following; saving his life from the scorpion; his dependence on Dolores? 7. How was suspense generated by the techniques of the film its use of darkness, music, audience expectation of what was to happen? 8. How greedy was the young man? Should he have taken Shaffner to Mexico? 9. How lacking in feeling was Shaffner ? his pleasure at getting into Mexico, his disregard of the young man, of the murderer's wife and the funeral? Were you pleased that the Mexican police made it so difficult for him to move? 10. Is international law fair for criminals like Shaffner? Does it help them to escape justice by living in such countries as Mexico? Should it? 11. Did your feelings for Shaffner change as the Mexicans refused to help him at all and the millionaire became an outcast? Was the Scotland Yard plot to get him back across the bridge fair? 12. What did Shaffner learn about life and wealth when reduced to being a beggar outcast with no friend except the dog he once despised? 13. Was it credible that he should risk life, imprisonment, to rescue the dog? How much did Dolores mean to him? 14. Was Shaffner a redeemed man by the end of the film?